St. Timothy’s is an exceptional church in three ways. We are a home-grown Orthodox Church (see “About Us), which was later adopted into the Orthodox Church in America. Unlike most home-grown churches in America, St. Timothy’s did not begin because of it’s members primary concern for doctrine or teaching; it began out of a longing for the truest and fullest worship. That concern is deeply Christian, deeply Orthodox, and it led us into the most ancient and traditional teachings. In this video, when describing the Transfiguration icon, I misidentify Andrew as Peter! Speaking extemporaneously, I was expecting Peter, James, and John, I guess; as at the Transfiguration -- and there are good reasons for including Peter, as he is included in some other Resurrection icons. But, including Andrew: first called Apostle, once disciple of the Forerunner, who pointed Andrew toward Christ, after which Andrew told of to his brother Peter, fits the overall theme of this particular Resurrection icon very well! The absence of his distinctive curly beard and hair ought to have alerted me, as well as Andrew's own distinctive beard. Thank you to iconographer Nicholas Tsai for pointing out my error to me! 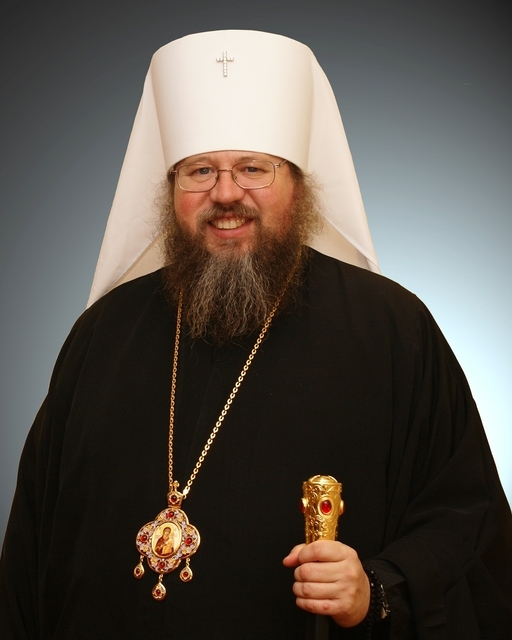 WHY ARE YOU AN ORTHODOX CHRISTIAN? "Why I converted to Orthodoxy: Western Christianity is a tree that has split so many times that the religion is in splinters. The disagreements come when men disagree with other men or when individuals decide that Christianity requires adaptation to survive in the 21st century. Orthodoxy, forever solid, is the faith once given to the Apostles that has come intact down to modern times. It hold the original teachings of the Church sacred, not continuously rewritten through a modern lens. I like having a Church where I know the teachings have been and forever will remain the same, not subject to reinvention every few decades. "Orthodoxy is the fullness of worship. Every minute of Divine Liturgy worship, the mind and body and soul fully participate. I used to find my mind wandering off in other churches, but never with Orthodoxy! There are no "Grandparent Sundays" etc, every worship event enjoins us to transcend time and space to join the universe of Christians who have kept the faith before us and join the eternal and ongoing worship of the Trinity. "The visual and physical worship help us to see the saints, who like us, were once sinners, but with perseverance and faith, worked out their salvation. It reminds us that we, too, should not give in to sin, but that we continue to work out our salvation. Seeing the icons, the pictures of those who literally kept the faith, reminds me that others have struggled and earned their salvation. Seeing the saints daily reminds me that Christianity is not just 'here and now" bu is timeless and eternal. "A visit to an Orthodox church was the first place I heard the phrase, 'I was saved, I am working on salvation, I will be saved.' This, to me, answered all the arguments amongst all the churches, on the concept of salvation. Yess, we begin a journey, but it requires commitment and effort to continue to work out God's plan for us. No, we can't take a one time conversion as a 'free pass' to do what pleases us ever afterward, resting on our laurels. "Orthodoxy is a lifestyle. This is no Sunday only commitment. Orthodox is better than any personal coach you'll ever find. The Church teaches us how to pray and commits us to a daily program of prayer and repentance and self discipline, helping us to live a sacramental life each and every day. Especially note Bishop Mark's saying that, during Lent, we do not so much "give up things" for Lent, as we "throw them out." And that, "bad habits are thrown out to be replaced by good ones." Meat we will eat again (it is then, not a bad habit, whereas feasting on the discomfort of others certainly is! ), but as we look forward to celebrating the Great Feast of Pascha, let us not look forward to resuming those bad habits we have worked so hard to throw out! That is part of the cleansing power of the Great Lenten fast. For those who heard Bishop Mark at our church Saturday, this is the presentation of all that he discussed more informally with us then. It is excellent. It gives a good sense of the central role of the Scriptures in our Orthodox Christian faith and life. To hear Fr. John's presentation, open the "Lectures" page, from the menu on the left. Fr. Tomas' presentation at Furman University on February 6th will be posted as soon as it becomes available. His talks were well-attended and very beneficial to our spiritual lives. especially his remarks related to his own spiritual experience. Fr. Jonah, later Metropolitan of the Orthodox Church in America, first gave the talks now summarized in this text: Do Not Resent, Do Not React, Keep Inner Stillness, at the St. Mark's Orthodox Church, Irvine, CA. Here are links to the original talks. Rt. Rev. 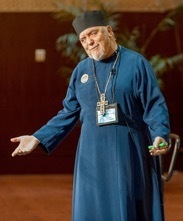 Meletios (Weber) has been the pastor of Prophet Elias Greek Orthodox Church in Santa Cruz, California since 1994. He was received into the Orthodox Church by Bishop Kallistos Ware in 1971. He was educated at Dulwich College and Oxford University in England, and has a doctorate in psychological counseling. He studied Theology at Oxford and the University in Thessalonica, Greece. He has been an high school teacher and a university professor. He was tonsured a monk at the Community of St John on the island of Patmos in 1978. Fr. Meletios has served the Orthodox Church in Greece, Great Britain, Montana, and California, and the Netherlands. 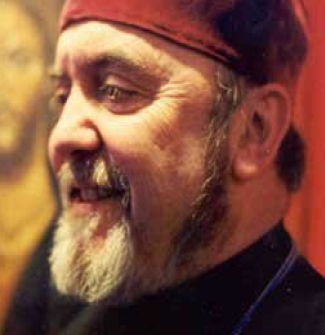 In June 2008 Fr Meletios was named abbot of St. John of San Francisco Monastery (Manton, California). Fr. 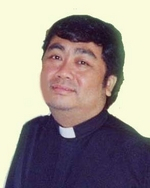 Daniel Byantoro was the first Indonesian Orthodox Christian in the current era. He has converted over 2,000 to Christianity. Gordon Walker has said of him: "He is truly gifted by God to be an Apostle to Indonesia. Fr. Daniel has just given three talks in our area. Are three are available here! "Head, Heart, and Belly: C. S. Lewis on Education and the Human Person"
Lewis scholar, Deacon Andrew Cuneo's Phd in English is from Oxford University, England. Dn. Andrew recently spoke at the Bird & Baby Philosophy Club, at 1008 W. Poinsett St., Greer, SC, drawing his insights from Lewis' book, The Abolition of Man. Many thanks to Dr. Cuneo for his permission to add his presentation to this webpage! Fr. Michael preaches greater understanding across race and culture. He is a leader in building cross-cultural relations in Alaska. He is recognized as an "Elder" by the Alaska Federation of Natives, has been honored by the Alaska State Legislature, and the National Governor's Association.